Mommy’s wrist is a term for DeQuervain’s tendonitis, a type of painful tendonitis common in young mothers. This causes pain on the thumb side of the wrist, worse with movement of the thumb. Opening jars, turning door knobs, and caring for the young child can be difficult. 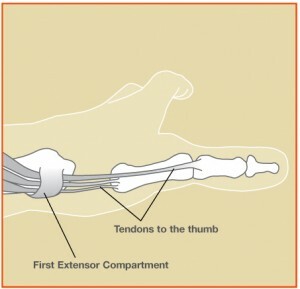 Symptoms arise when there is irritation of the tendons of the thumb within the surrounding sheath at the wrist. Instead of gliding smoothly through the sheath, the abductor pollicis longus (APL) and extensor pollicis brevis (EPB) tendons can be swollen, irritated and painful. Patients report pain in the thumb-side of the wrist. Certain movements of the thumb and wrist can be excruciating. Patients may feel a tender cyst or bump and notice swelling in the wrist. Lifting objects, gripping, or pinching with the thumb often increases symptoms. Occasionally popping of the tendons is noticed by the patient. The cause of DeQuervain’s tendonitis is usually unknown, but symptoms can be brought on by starting a new, repetitive activity. The condition is common in females, especially pregnant women and mothers of young children. It has been called “mommy’s thumb” or “mommy’s wrist” because of this association. What are the treatment options for Mommy’s Wrist?